The theatrical version was compared with the director's cut. Both are on the US Blu-ray from Sony. Somewhere in Europe during the Stone Age: A buffalo hunt leads to a tragic accident in which the young hunter Keda is thrown off a cliff. Declared dead by his companions he has to fight his way through the wilderness alone with a injured foot. When he is attacked by a pack of wolves, Keda seriously injures a wolf but the rest of the pack escapes. Keda decides to nurse the wolf back to health and she accompanies him as he makes his way back to his tribe. The beginning of an unusual friendship. Albert Hughes has made some very successful films with his brother Allen so far, be it the gangster drama Dead Presidents or the film adaptation of the graphic novel From Hell. With Alpha he now directs alone for the first time and tells a story of friendship between man and wolf in opulent pictures. The odyssey of the young hunter who fights his way back to his tribe on his own, is a real thrill ride, which is mainly due to the acting of Kodi Smit-McPhee. The US Blu-ray features both the theatrical version and the director's cut of the film. The most striking difference of the director's cut is that the scene in which the hunters meet the herd of buffalos is no longer to be seen at the beginning of the film, but is chronologically arranged correctly in the film. Apart from that, it's noticeable that some elements have been softened for the theatrical version, probably to make it more family-friendly. The director's cut of the movie fades away when Alpha lies injured in the hut at the end, suggesting that she may have died. In the theatrical version another scene follows, in which Alpha and her puppies can be seen at Keda. Among the deleted scenes is a scene in which the deceased Alpha is burned by the hunters. But this scene was not integrated into the movie. Otherwise there are many smaller, sometimes insignificant changes. In the theatrical version there is a missing scene when Keda breaks his foot when falling off the cliff and later some shots of his injured foot have been shortened a bit. Also, Keda's injuries on his face were digitally attenuated for the theatrical version. The director's cut is clearly the better edited version of the movie. The half-baked compromise to the mainstream audience to grab the action scenes at the beginning of the movie was reversed, moreover the open end about Alpha's fate moves much more. After the date insertion, the theatrical version shows the scene with the hunters at the buffalo hunt. They sneak up and force the herd with their spears towards an abyss. One of the buffaloes breaks out of the herd and attacks Keda, who gets his vest caught on the baffalos horn. The buffalo runs towards the abyss with Keda. Keda is finally thrown into the abyss. Then "One week earlies" is faded in. In the DC instead, the sunset can be seen a bit earlier. The scene with the villagers begins somewhat earlier. Before Tau helps Keda up, he can be seen a bit longer. Tau turns away to the side. The campfire can be seen a bit longer. In one shot you can see the hunters eating. The next shot where Tau is looking towards Keda starts earlier. Keda can be seen two frames longer, then you can see the other hunter earlier. Keda can be seen longer, then Tau a bit earlier. Keda is a bit longer to be seen, than he sits down. The darkness is longer to be seen, then Tau earlier, before he turns to Keda. The camera moves longer towards Keda before the stones can be seen. In another scene, the hunters cover themselves with mud. The hunters are a bit longer to be seen. In another scene, you can see the hunters sneaking up. Again you can see two additional scenes in which the hunters sneak up. The KF shows only short scenes from the hunt and the tragic accident, as the full sequence was already visible at the beginning of the film. The DC shows the complete scene of the attack on the buffalo herd. In the sequence in which Keda falls into the depths, his facial injuries were digitally attenuated in the theatrical version. Keda twists his leg during the fall. He screams in pain. Tau can be seen earlier while he passes between the buffalos. Tau can be seen a bit longer before the camera cuts onto the birds. The camera's on the hunters. Tau mourns on the cliff. Keda's injured foot can be seen a bit longer. The DC shows an alternative scene to Keda's mother when she is told of her son's supposed death. The DC shows a cut on Tau, then the hunters run towards Keda which is lying on the ground. The theatrical version shows a further scene of the reunited family. The theatrical version shows Keda and Alpha watching the sunset. In the background, the puppies of Alpha are playing. Keda takes one of the puppies in his hand and it starts howling. In the DC the movie title "Alpha" is displayed instead. 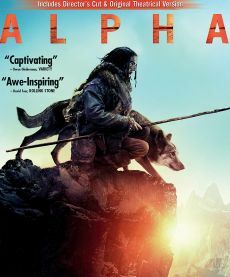 The theatrical version shows the movie title "Alpha" after the hunters were seen with the dogs.